Sony’s HDC-4300 4K/HD camera live production. Hawaii, January 2016: The 2016 Sony Open in Hawaii PGA TOUR event will be shot and broadcast in HD on Golf Channel using Sony professional cameras, continuing Sony’s long-running tradition of providing HD production technology for major live entertainment and sports events. The tournament is also the latest testing ground for 4K live production and broadcasting. In addition to multiple Sony HDC high-definition cameras positioned across the course, Sony’s HDC-4300 will capture action on the 17th hole in 4K resolution, delivering four times the clarity and resolution of full HD. Sony’s HDC-4300 4K/HD camera system, the world’s first camera to use three 2/3-inch 4K image sensors, will be used in a dual role: they will be used in the main broadcast, matching images with the HDC-2500 cameras used for the rest of the broadcast. The HDC-4300’s will also simultaneously record 4K HDR images to separate servers as part of Sony’s ongoing research in HDR production. 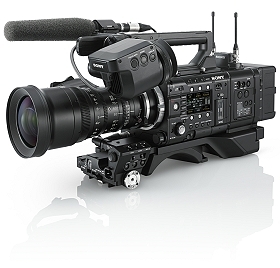 The HDC-4300’s will be flanked by F55 S35mm cameras that will provide on course segments that will be used for the 4K HDR production as well as being converted to HD for the main broadcast. Sony is using the tournament to capture 4K sports content for demonstration purposes. Multiple viewing areas will be set up throughout Waialae Country Club – the tournament venue – equipped with Sony 4K televisions and allowing guests, customers and media to view 4K content up close. Sony has been a leader in 4K technology from the beginning, starting with the 2005 introduction into movie theaters of its commercial 4K projector. Sony’s F65, F55 and F5 cameras are actively in use shooting feature films, TV shows, documentaries, commercials, videos, sports and more. In addition to its 4K Ultra High Definition TVs (84-, 65-, and 55-inch sets), Sony also offers a 4K home projector, and a full line of 4K-capable home entertainment products like Blu-ray players and receivers. The Sony Open in Hawaii will continue the PGA TOUR’s tremendous momentum on the Hawaii Swing following record viewership of last week’s Hyundai Tournament of Champions on Golf Channel. Headlined by Open Championship winner Zach Johnson, current FedExCup points leader Kevin Kisner and U.S. Ryder Cup Captain Davis Love III, The Sony Open in Hawaii airs live on Golf Channel in primetime, Thursday-Sunday, January 14 to 17.